Loco-diablo had the most liked content! Absolutely. 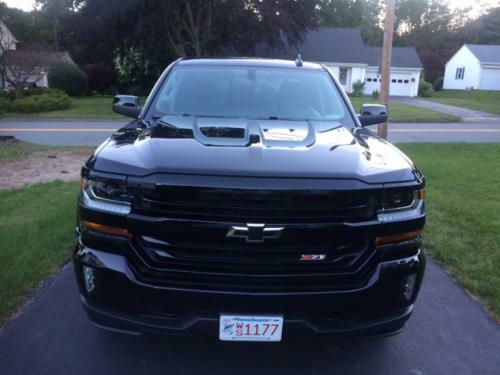 At the time i bought, there were no additional incentives offered if you used GM financing.. The offer at the time was 18% off sticker on dealer stock. It didn't matter how you paid for it. You can get a great rate, incentives and all discounts and rebates, but they're all negated if they pork you on your trade. They tried to screw me on my trade of a 2008 Tacoma.. KBB/NADA trade was $8000 - $9000 , they offered me $3000... After I got up out of my chair 2 or 3 times, I got my $8500..
Duratracs were OE on my 2017 midnight edition.. I have NO problem with the noise. At 32k miles they're wearing nicely. I live in New England and they are beasts in the snow. When it comes time to replace, I will probably go with them again. It may have been compromised at some point and finally let go.. I doubt it would be a manufacturing defect on a 4 to 5 year old window. Especially in the climate where you live with drastic temp fluctuations throughout the year. If it was a defect, I'd think it would've blown out sooner. To each his own..black on black is beautiful! You'd think it would be. It was part of the LT PLUS package on my 2017.. package also included sliding rear window and adjustable pedals. Almost 2 years into my capless 2017... I bought a GM OEM cover, but only used it for a week or so because it was a pain to remove..That being said.. the filler seems to stay pretty clean behind the the filler door. At 32k miles, I haven't had any fuel related problems..so I don't use any type of cover. 22 months into the xpel ultimate on my 2017 midnight edition.. still looks perfect... ZERO chips.